Solar that works at night! 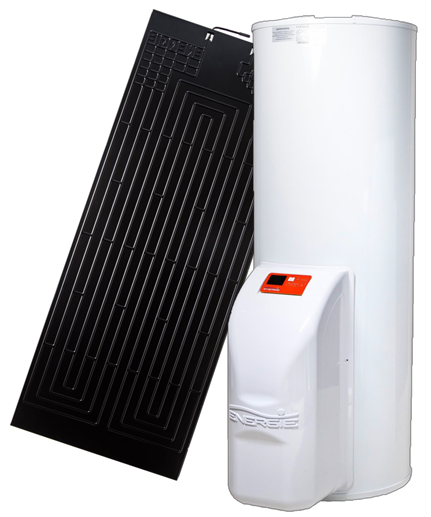 The Eco thermodynamic solar hot water system efficiently heats all the water for your family or business – you can expect huge reductions in your energy bill of up to 85%. It’s a solar hot water system, but it also works at night, in the rain, snow and wind. How? Eco works on the thermodynamic principles of evaporation, condensation and compression – all these processes generate heat. As the system uses differential temperature (the difference between the temperature of the air around the panel and the very cold refrigerant liquid in the panel), it works all the time, even at night. All you need is one lightweight aluminium solar panel and the Eco hot water cylinder, which has an in-built compressor and heat exchanger. Eco offers you the enjoyment of hot water up to 55oC, 24 hours a day, 365 days a year with high energy efficiency and without putting CO2 into the atmosphere. European designed, developed and manufactured by an international recognised brand, this quality product is maintenance free, so once installed, you can forget it and think about how you will spend your savings! Ideal for new builds or if your cylinder needs replacing. A range of cylinder sizes from 200-450 litres to suit your water usage needs. All come with a thermodynamic solar panel (some larger systems require more panels). Do you have a demand for large volumes of hot water for your business? The Eco technology scales up so is ideal for motels/hotels, gyms, restaurants, breweries, hospitals, schools, campsites etc. Want to keep your hot water cylinder? Solar Box connects to your existing cylinder and uses the same Eco technology to save you up to 75% off your hot water bill. It comes with one thermodynamic solar panel. With a variety of products & solutions available, contact Air Con NZ today for a free assessment on your hot water needs.